The Lakeside Trail is illuminated by energy efficient LED lights, with snow removal during the winter months, for year-round enjoyment. 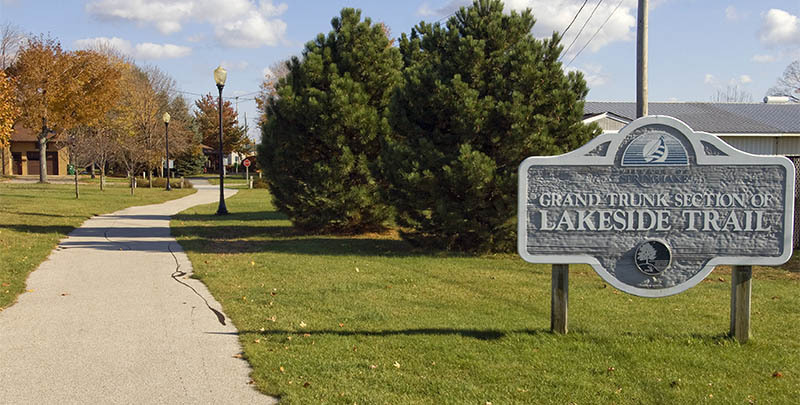 Lakeside Trail continues into and continues into the North Bank Trail, provided by Spring Lake Township, which is a continuation of the Rail-Trail that extends east 3.3 miles into Spring Lake and Crockery Townships. The North Bank Trail is a planned regional trail that will eventually extend to Nunica, Coopersville, Marne and Grand Rapids and will also connect to the Musketawa Trail and the future Spoonville Trail. The North Bank Trail (NBT) is a proposed 18-mile non-motorized, multipurpose pathway located generally along the former Grand Trunk Western Railroad right of way that extends from Spring Lake to Marne, MI. The NBT will connect the east end of Lakeside Trail in the Village of Spring Lake to the southeast end of the existing Musketawa Trail, otherwise known as the Fred Meijer Pioneer Trail. Ultimately, the NBT serve as a regional link between the beaches of Lake Michigan and the Grand Rapids metro area. The NBT will provide connections to other regional trails including the Lakeside Trail in Spring Lake, the Fred Meijer Pioneer Trail, the Musketawa Trail and the Spoonville Trail offering access to the southside of the Grand River where is meets up with the Grand River Greenway trail system. The NBT also links up to local trails in Spring Lake Township and Ferrysburg that offers a connection to US Bike Route 35 that run along Michigan’s west coast from New Buffalo to Sault Saint Marie. Phase 1 of the North Bank Trail, 3.3 miles from Fruitport Road to 130th Ave, was opened and dedicated October 10, 2011. This beautiful section of non-motorized trail was made possible by the cooperation of many individuals and organizations including: The Michigan Department of Transportation, Spring Lake Township, Crockery Township, the Friends of the NBT, North Bank Community Fund, (which is part of the Grand Haven Community Fund), the Coopersville Community Foundation, the West Michigan Trails and Greenways Coalition, the Ottawa County Health Department, Department of Natural Resources Trust Fund and many generous private donors including the Shape Corporation and the Verplank Family. The NBT will link the larger urban communities of Grand Rapids, Marne, Coopersville, Nunica, Spring Lake and Grand Haven In most cases, the NBT and its linked trails run through the heart of the downtowns and bring the promise of a new found economic stimulus. Coopersville, MI, is a great example as the downtown area was originally developed around the Grand Trunk Western Railroad and old US 16. When interstate 96 came through, much of the commerce activity became focused towards the highway interchanges. The NBT will run through the heart of downtown, likely bringing more tourism dollars and possible creating a bit of a revival. The NBT will offer an alternative transportation route and offer commuting options while providing access to the region’s natural areas, parks, and civic destinations. For example, this trail will connect to over 26 miles of bike paths in the Spring Lake area which will provide easy and safe access to destinations such as North Beach Park on Lake Michigan, Rycenga Park in Spring Lake Township and the tourist town of Grand Haven and the Lakeshore Bike Path with off-street access to the Holland area.